"Hampi" in the state of Karnataka in India is the site of the once-magnificent capital of the Vijayanagar Empire. The ruins are a UNESCO World Heritage site. 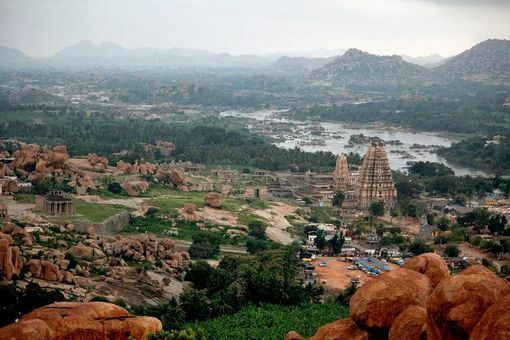 In 2015, the Hampi festival is on from the 9th to the 11th of January. Hampi was the imperial capital of Vijayanagar, a 14th century empire. The ruins are spread out over an area of 26km². "A Forgotten Empire" (ISBN 1419101250) by Robert Sewell is an interesting book which describes the rise and fall of the Vijayanagar empire. Before the fall of Vijayanagar, diamonds were sold on the streets, but the main street selling diamonds and other precious stones was surprisingly called Pan Supaari Street (translated in English, it means betel-leaf betel-nut street). A visitor can still see the exact location of Pan Supaari Street in Hampi, which has been marked with a board by the Archaeological Survey of India. Hampi is well worth the visit. The area is simply stunning and you will be in awe of the millions of boulders surrounding the area. Within this arid landscape lies a little oasis with lush palm, banana, and mango trees nestled near the river. Hampi is a great place to spend a few days wandering around and discovering the rich, vibrant history while also having a bit of 'you' time. Hampi hosts Hampi Utsav every year during first week of November. It is a visual delight as all the monuments/ruins are lit at night and it is a cultural extravaganza of dance and music. 2010 marked 500 years since the Vijayanagar king Sri Krishnadevaraya ascended to the throne. The nearest airport, Jindal Vijaynagar Airport (VDY), is located near Bellary and around 40km from Hampi. As of May 2018, TruJet connects the airport to major hubs such as Bengaluru and Hyderabad with a few short haul, twin-engine turboprop airliners. The nearest relatively major airport is at Hubli, 143km away from Hampi. Consider flying into Bangalore, a major international hub. Flying from places like Goa means that you have to change planes in Mumbai (or Bengaluru), making it an expensive and time consuming trip, and therefore useless. The nearest railway station is Hospet Junction (IR station code: HPT), 13km away. Overnight trains run several times a week from Bangalore, Hyderabad and Goa. The trains are a much cheaper and more comfortable route than the tourist buses most people are led into. (2nd class air-con - bed with linen - costs ₹750 from Bangalore to Hampi). You can also catch an overnight train from Mysore to Hubli and from there to Hospet/Hampi. You can also get an overnight train, the Hampi Express, direct from Mysore to Hospet Junction. It departs Mysore at 18:15 and is scheduled to arrive at 07:45 the next morning. From Hospet train station it is very easy to hop on a local bus which goes between the railway station and the main bus station and onward to Hampi (same bus). Rickshaw drivers in the area will overcharge for the minimal distance between the bus station and the rail station (even lying to say there is no bus! Don't listen! ), and to Hampi it's a long, dusty ride in a rickshaw (₹170-200). The buses are very frequent. It's about a kilometre and a half walk from the train station to the bus station. From the rail station to the bus station the bus is 6 rupees, from the Hospet bus station to Hampi it is 12 rupees. Bangalore: 350km. Drive till Chitradurga on NH-4, take a right turn on NH-13 towards Sholapur till Hospet, and then drive another 13km to reach Hampi (direction towards Hampi is well marked). The road is in excellent condition till Chitradurga but then deteriorates rapidly. You are also likely to encounter traffic jams due to ore-laden trucks plying on NH-13. There is an alternate route to Hampi from Bangalore via Ananthpur and Bellary. Road to Ananthpur is excellent but the road to Bellary from Ananthpur is bad. Chitradurga road is highly recomended as on Jan 2015. Route from Chitradurga to Hospet is in pathetic condition. There is another way from Bellary to Hiriyur. This is awesome route nothing less than main highway but with no divider. Strongly recommend to use this way from Bangalore. Hyderabad: 360km. Take NH-7 till Jadcharla X-Road, turn right towards Mahboobnagar and carry on till Raichur. From Raichur, take Karnataka State Highway 20 towards Lingasugar, turn left at 10km after Raichur onto Karnataka State Highway 23 to Sindhanoor. The road on the last 15-25km stretch, after Gangavati, is not so bad. Lots of speed breakers in Karnataka. The 5-10km stretch just before the Andhra Pradesh - Karnataka States Border on Andhra Pradesh side is full of potholes. Mumbai: About 800km or less: take NH-4 upto hubli & then go via Gadag-hospet. Alternately, take NH-4, exit to Sangli/Miraj, Go to Athni -Bijapur. (Donot take short cuts as roads are real bad.). You may choose to see Badami, Pattadakkal, Aihole as a 2 day add on excursion, else proceed to Hampi next day. Roads are average except speedbarkers combined with potholes and heavy traffic of large trucks. (Strictly avoid night driving). Prefer high ground clearance cars on this roads. Karnataka State Road Transport Corporation operates daily buses to Hospet from Bangalore, Mysore and Gokarna. From Hospet you can go to Hampi on a local bus for ₹16. The local buses take about half an hour to reach Hampi. The last bus to Hampi from Hospet bus stand is at 9.30 pm and the last bus from Hampi to Hospet is at 8.30 pm. After 7 pm the frequency of buses is one in every half an hour. There are private bus companies operating from most places in Goa and from Gokarna which run an overnight service to Hampi. Unfortunately, there is no direct return so you take a local bus (or taxi) to Hospet and take it from there. The real pleasure in exploring Hampi comes from being on a bicycle or by walking around. Virtually every rock in Hampi has a story to say. This story is best heard if you give it time and walk around from rock to rock.You can even visit the State Tourism Center inside the premises of Virupaksha Temple from where you can avail bicycle tours around the ruins accompanied by a guide. The guides will show you a booklet saying that the government approved rates are about Rs. 1300 for 4 hours (half-day trip) and Rs. 1800 for 8 hours (full-day trip), but do not take it at face value. You MUST bargain for a fair price and make sure you and the guide have both agreed to the list of places that the guide will take you to. This is very important before you finally decide to hire their services - ask them to clearly tell you the list of places that they will cover. A better choice would be to approach the Tourist office at the Virupaksha temple and hire a guide from the office. The tourist office guides have a fixed rate and will cover all the important places. For any complaints, you can always go back to the office. Bicycle is the best way to explore Hampi if you enjoy history, culture and nature. It usually costs about ₹120-150/day. Helmet and lock is included in the price. A little bit of walking is always required for exploring sites inside and out. Lakshmi heritage tourist home has some of the best bicyles for rent. Bicycle might sound an exotic option but you cannot take the cycle to several attractions due to the rocky terrain, so be mindful of that. Another more convenient variant to see all the sights without climbing the hills is by Rikshaw. Bargain with your Rikshaw driver for a fixed rate (₹800-900 for a full day seems to be okay [Dec 2016]) and then hire an official Karnataka Travel guide (at the tourist office, they have fixed rates: 4h = ₹500, 8h = ₹800). It costs a little bit, but the explanations help you to see more then just stones and temples. To get an estimate of cost/content, you can talk to the guides before coming down to Hampi. The guides willingly share their cellular numbers and email addresses. It's very hot! Dry, dry heat. And the walk between some sites can be at least 5km. But, the surrounding area is quite breathtaking to ride around and you can explore some parts that the rickshaws won't take you. Guides are willing to ride on the back with you as well. This is a cheaper option than the rickshaw and it gives you more freedom as you can cover more in one day without rushing it. Take a guide with you one day, then do it all again by yourself the next. In Hampi, registered TVS Moped (2-wheeler gearless bike with yellow coloured registration number on a number plate with black background) is available at Rs. 250 (Feb 2017) a day! They usually charge Rs. 100 for a litre of petrol, which has to be paid additionally. 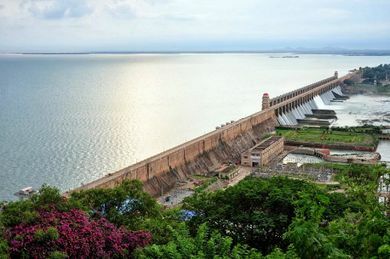 A litre will be sufficient for sight seeing around Hampi (including Vitthala temple), but two litres would be handy if you have plans to go to Tungabadra Dam (some 15km from Hampi). A petrol pump is located in Kamalapur (about 4 kms from Hampi), which sells petrol at market price. Please note, that on the other side of the river (Virupapura Gaddi) bigger scooters and bikes are available on rent with regular number plates (white background with black text), but they are not supposed to be driven in the Hampi area. Rentals on the other side of the river are cheaper. It costs Rs. 250 a day for Honda Activa, TVS Jupiter, etc (100-125 cc gearless scooters), while the TVS mopeds are available for 150 a day (Feb 2017). Petrol is same—additional Rs. 90-100 for a litre. A litre is sufficient to cover prominent spots on the other side of river (Hanuman Temple, Pampa Sarovar, Anegundi village). Also there is a petrol station just north of Anegundi village on the main road. When renting a scooter or motor bike, petrol costs extra, and is normally sold at a 40-50% premium in the place you rent (a litre costs ₹100, Feb 2017). The countryside is a beautiful place for a leisurely drive so it's worth taking some extra fuel. Most motorbike rental services are illicit when the motor bikes do not have yellow-black number plates. In India, commercially used vehicles which are chauffer-driven have plates with yellow background and black text where as vehicles for self drive will have the opposite – black plates with yellow text. Vehicles with white background and black text are for private use– they are not supposed to be used for commercial purposes like rental service, but even now (Feb 2017) they are widely used on the other side of the river. In the past, tourists have been harassed by the district police for illegal bike riding and charged penalties ('October 2014'). Few of the motorbike rental services warn visitors about this or offer any help. Moral: When in Hampi, make sure you only hire bikes with black plate and yellow text. However, the other side of the river is generally lax about this rule, so you MAY rent a vehicle there without expecting any trouble. You can rent a 2-wheeler in Hampi and take it to the other side of the river on a ferry, but do not rent on the other side and take it to Hampi! The ferry boat is available at the river side near Virupaksha Temple. Ferry trip costs Rs. 10 one-way and usually stops by 6 PM, depending on the crowd waiting to cross over. Coracle rides are available at INR 50 per head throughout the day and are available until 9-10 PM. If you don't like getting your feet wet in a coracle, ensure you don't miss the ferry. Various Car Rentals are available in Hospet. They normally charge ₹750 to ₹1,000 for a day's sightseeing and pick up/drop off at railway station etc. There are several car rental companies in Hampi/Hospet. Car rentals are also available from various rail heads and airports near by like Bangalore, Goa, Hyderabad, Belgaum to Hampi. The ruins of Hampi are located within a 30km² area but many of the famous places have serviceable roads leading up to them. But be ready for a bit of walking at most of the spots! Most of the guest houses are on the other side of the river, an area called Virupapur Gadde. To access them, you need to cross the river by Motor boat (₹50 for tourists, less for locals, boat runs until dawn). After sunset, boys with small paddle boats can ferry you across the river (depending on the time more than ₹250) till 10.30pm. If you can't catch a boat, you have to pay around ₹1500 for an auto to take you to the other side via Hospet-Hugili-Hanumanhalli, which is a 40km tour. During moderate/high rains, the gates of the Tungbhadra dam are opened which increases the water level and water flow in the river. In that case, you might get stranded on the other side of the river (Virupapur Gadde area). Taking a guest house or hotel in Hospet (25min to Hampi by Bus, ₹20) is a noteworthy alternative to booking north of the river. Hampi is a visual delight, especially due to its stark contrast from most other places. Rocks are all you see whichever direction you look at. Vegetation is visible in the wet months, but again it never dominates the landscape. It is an ideal spot for people who are interested in history and/or nature. 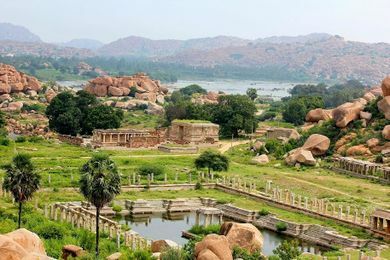 There are many sites of interest in and around Hampi. 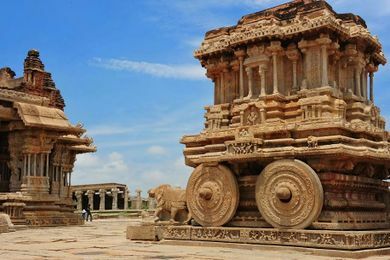 The must-visits are Virupaksha Temple, Hampi Bazaar, Monolith Bull, Lakshmi Narasimha temple, Hemakuta Hill temples, Big Shivlinga, Vithala Temple (the famous Stone Chariot is located here), Hazara Rama Temple, Royal Enclosures, Queen's Bath, Zanana Enclosure (which also houses the Lotus Mahal), Elephant Stables, Achyut Raya temple, Statue of Lakshmi Narasimha (often mistaken for Ugra Narasimha, a fiery form of Vishnu, owing to the damage suffered by this monolithic statue), Mahanavmi Dibba, the Stepped Bath, and the Matanga Hill (from where one can see the most beautiful sun set ever). All these places are on the Hampi Bus Stand side of the river. You can buy a local map costing ₹15, and cover all the places on your own by foot or renting a bike or scooty. See "Get around" section above. Otherwise, you can hire a car to do local sightseeing. It would cost you about ₹400-500. Tungbhadra dam is 16km from Hampi towards Hospet. If you have plans to catch your train/bus back from Hospet, you could see Tungbhadra dam on the way to Hospet. It takes around 45min to 1h to see Tungbhadra dam. You need to park your vehicle at the entrance and take Govt bus to the top and back. It takes ₹20 for to and fro. There are also several "Shivalings" along the river which the boatman will guide you to. The old capital called Anegundi, across the river from Hampi also has many sites. You can also go to Anegundi from Virupapur gadde by road. There is a road alongside old broken bridge (Bukka's Aqueduct). The Hanuman Temple on Anjenaya Hill (involves climbing up 572 steps, is believed to be the birth place of Hanuman) and the Pampa Sarovar are worth a visit. Both of these places are around 2-8km from Old broken bridge. There is Daroji bear sanctuary around 16km from Hampi, opposite side of Kamalapura/Hospet. It is open from 13:00-18:00. Not a must see but you can go there for a nice drive/ride if you have some time to kill. To do justice to all the sites, you need a minimum of 3 full days of sight seeing. To discover all the ruins, it may take much more than 3 days - perhaps months. A good amount of walking is a must, as the ruins are scattered over a huge area. Moped/bicycle hire is a good option to move around. Cross the river by one of those coracle ferry. If you can not swim, ensure that the coracle is not overcrowded. Your life is at stake. As of March 2013, the cost is ₹10 per person and ₹5 for each piece of luggage. The other side of the river (Anegondi) spots a number of pre Vijayanagara relics. If coming in April to September time (off season) do check with the hotel for bookings especially if you plan to stay on Anegondi side of the river. Except a few prominent ones (e.g. Shanthi Guest House, Mowgli Guest House etc), the other guest houses and restaurants close down. If you go there in June to August, you will not find the coracle ferry in action, the river is usually very high then, so if you want to go Anegondi you have to travel c. 40km. You may not appreciate Anegondi after Hampi, since there is little to see except the Hanuman temple on Anjana hill - but be prepared for a climb of about 600 steps. Sanapur Lake is a must-visit. You can hire a moped or a bicycle to reach there, which is around 5-6 kms from the Hampi island. The serene and tranquil surroundings of the lake is an ideal place to relax and unwind, a true delight for nature enthusiasts. If you are staying at Virupapur Gadde side of the river, plan and return by 18:00. If you have a train/bus to catch in the night, checking out before 18:00 helps. If the ferry closes, the auto/car option becomes a much longer and costlier affair. Rockclimbers frequently visit Hampi to scale the boulders and can often be seen around with their crashpads, mostly on the Virupapura Gaddi side of the river. Wildlife - The occasional crocodile may be encountered in the river or on rocks midstream, sometimes several metres long. Leopards frequent some of the rocky hills, sometimes not too far from human habitation, and may venture out at night to prey on dogs or the odd goat. Sloth bears are not only confined to Daroji sanctuary, but may wander the sugar cane fields at night. They can be dangerous when encountered with cubs in tow. As many as 185 species of bird can be identified at various times of the year in the Hampi environs. Hampi Children Trust takes care of 38 children with studies, food (all 3 meals, seven days a week) and medical care. Some children live in-house while others stay in the locality. Spend time with the children on scheduled picnics every Saturday from 15:00 to 18:00. Their language teacher, Chidu, takes them to a pre-designated area (the river area, Matunga Hill, etc) where the children let their wild streak take over. Set up by a Britisher, Tim and local Kalidas. See their neat classroom with weekly responsibilities laid out for each child for the upkeep of the trust. Ask for a scrapbook made by other volunteers as part of their art projects. Sundays closed. Ask for longer duration volunteering options if interested. Directions: Hampi main bazaar. From the main road leading up to the Virupaksha temple, take a right to go into the main bazaar. The trust is a few metres on the left. They accept voluntary donations or dedicated sponsors at ₹12,000 per child, per year. The Kishkinda Trust TKT focuses intensively on the capacity building of the locals, the villagers, across multidisciplinary fields of creative and cultural industries- architectural conservation, heritage restoration, crafts and design, management and hospitality, so that their lives are nurtured, enriched and empowered by their own culture and identities. In this process of reaffirming ties between tradition, everyday commerce and the quality of life, they shall share their fruits of labor with the visitors in the celebration called ‘LIFE’. The Kishkinda Trust accepts volunteers and takes care of their accommodations and food for exchange of range of quality services that the volunteer(s) can choose from. There is no working ATM in Hampi. Kamalapur and Anegundi (2 ATMs in Anegundi) are the nearest options. The red bus (8rps) leaves every half-hour or so from the bus stand. Rickshaw drivers want 200rps. The stone carvings are made by local artists and are a good buy here. The same things in Bangalore will cost ten times the price. The hand stitched blankets are also a good buy. There are lots of places in Hampi Bazaar where you get satisfying and inexpensive food, though be prepared for a long wait at most places as the chefs are typically family members who prepares food to order. However, they are good at their jobs and can offer a wide range of different cuisines. Laughing Buddha restaurant This is on other side of river (Virupapur Gadde) and close to Shanthi guest house. There are mattress, cushions and low benches in it. So, you can just lie down and sit at ease. Continental food is very nice here with good variety. It also offers Punjabi food. The Goan Corner , an idyllic cafe on the other side of the river is an experience in itself. Really really famous among the foriegner crowds, it takes a 10-15 min walk across the green paddy fields to make your way to this place.It is run by a very friendly family where the lady don, Sharmila reigns supreme.Unlike the other closely arranged cafes, Goan Corner is rather desolated and adds to the magic that Hampi creates. Sagar Hotel's Idli, Dosa & Gunta Ponganalu. Just besides Gopi Guest House and right infront of the Shambhu Guest House, which are located near the Virupaksha Temple, 'Shankaramma' under a thatched roof makes delicious idlies, dosas and the tasty 'gunta pongal.' Do not miss this place. The food is not only delicious but also very cheap. Mango Tree. The place has relocated from the banks of the river Tungabhadra to a shack near by. The food is fairly good and comparable to other restaurants but its pricing might pinch you a bit. Staff is courteous, remembers repeat visitors, changes dishes on demand without showing attitude, etc. Mango Tree serves primarily vegetarian food with some egg related items. No meat, fish or alcohol is served. Restaurant has both table and floor sitting options. Unlike many rooftop restaurants nearby, smoking is not permitted inside which makes it very good option for non-smokers or those who don't want second-hand smoke. Crowd outside this restaurant is testament to it's quality and service. Garden Paradise. This is behind the line of shops in Hampi Bazaar which are towards left in the direction towards Virupaksha Temple. Located by the banks of Tungabhadra river, the ambience is quite pleasant. Reasonably priced too. They offer huts as well for accomodation. Hampi is a religious centre so drinking alcohol is not allowed. Therefore, beer or other alcoholic drinks are generally not available at local restaurants. However, Hotel Mayura Bhuvaneshwari in the neighbouring town of Kamalapur has a bar that serves beer and wine. Ask your rickshaw driver to take you to Hospet, where you can purchase cheap booze from rowdy and definitely illegal but tolerated alcohol shops. There are several guest house in Hampi, though staying in Hospet or the nearby town of Kamalapur are also options. Staying at Hospet gives easy accessibility to Railway Station and better Hotels. Hampi is also not very far from Hospet. Staying in Virupapur Gaddi across river Tungabhadra is not a good idea. Whenever the Dam releases water, motorboat service is stopped due to high water level in the river, which stays for couple of days. There are no bridges nearby. The shortest road way from Virupapur Gaddi to Hampi is approximately 40 km. Autorikshaws charge around INR 1500 for the journey (October2014). Shanthi Guest House is situated across the river Tungabhadra. After you cross the river, take a left and at the end of the lane, as you walk besides paddy fields, is the Shanthi Guest House. This is a nice place to relax, as it offers cottage-style accommodation. It is managed by Krishna and Rao. The prices are around ₹900 per room (Jan 2014). There is a restaurant on site making good pizzas and acceptable local food for similar prices to other places nearby. Their phone number is +91 839 432-5352. Sunny Guest House is situated across the river(Virupapur Gadde, Hampi). It is a nice place to stay. They have a nice garden. This place is very calm and relaxing. The prices are affordable. Their phone number is +91 853 328 7169. Vicky's charges around ₹500 per room (Jan 2008) and has a mediocre rooftop restaurant. The rooms are not the cleanest and the bathroom definitely needs refurbishment. There are three computers downstairs and only the one on the left is in working condition. The other two are very slow. It used to be good until all the tourists swarmed into it under the guide of Lonely Planet. Rashmitha Guest House, Janata Plat, ☎ +91 839 424-1945 (owner's residence) or +91 948 164 5104 or +91 948 090 7200 (mobile). Checkout: 09:00. Recently refurbished en suite rooms with hot water, mosquito nets, and a backup generator for 24 hour electricity. Goa - Train 18047 (Amaravathi Express) from Hospet Junction to Vasco De Gama. General seating 125 rs., 8 hours. Leaves 6:30 am, to get general seating arrive an hour early and buy the ticket. Otherwise, book ahead for other classes. Only runs on Monday, Wednesday, Thursday and Saturday. Also stops in Margao station. This page was last edited on 17 December 2018, at 17:15.